The battle for peace has begun. The Enterprise leads a battle for peace in the most spectacular Star Trek adventure ever! After years at war, the Federation and the Klingon empire prepare for a peace summit. But the prospect of intergalactic glasnost with sworn enemies is an alarming one to Captain Kirk (William Shatner). "They're animals!" he warns. When a Klingon ship is attacked and the Enterprise is held accountable, the dogs of war are unleashed again, as both worlds brace for what may be their final, deadly encounter. Star Trek V: The Final Frontier damn near killed the franchise. Actually, I originally thought it did kill the franchise, at least as far as the original series went: the film was such a critical and financial failure that it seemed to spell the end of the road for the original cast. By the time Frontier was released in 1989, Star Trek: The Next Generation was doing quite well and its cast seemed poised to make the leap to the big screen. Of course, they would make that leap before long, but the original group wasn't ready to call it a day just yet. Amazingly, the crew returned from the dead – figuratively - and came up with one more film. In a parting shot equal to Ted Williams belting a home run during the last at bat of his storied career, the original cast ended their 25 year turn with 1991’s Star Trek VI: The Undiscovered Country, a film that stands among the finest productions within the Star Trek pantheon. Country offered something that most of the other films and much of the series lacked: a terrific sense of excitement. Oh, Star Trek always included its share of action, but they seemed to find a way to make these elements something less than scintillating. They moved the plot along and made the film more interesting, but the action in Star Trek never seemed to accelerate your pulse the way the best scenes of films like Star Wars or Die Hard did. There was something kind of drowsy about the action in some of these productions. That is most definitely not the case with Country. The film moves along at a crackling pace and rarely lets up. While watching this film, you sense that its participants knew that this was it for them and they wanted to go out with a bang. That they did; the race-against-time ending cranks the excitement factor to a level unimagined in such sedentary fare as Star Trek: The Motion Picture (alternate title: Star Trek: the Dullest, Most Pointless Excuse for A Special Effects Demo Masquerading as a Film). Note that this DVD of Star Trek VI presents a cut of the film that differs from both the 1991 theatrical rendition. This one adds a few minutes that deal with Starfleet’s proposed rescue of Kirk and McCoy as well as the plot to stop the peace process. This also involves a character not found in the theatrical cut via Colonel West (Rene Auberjonois). A lot of fans never liked those moments, and I must agree with them; I think the film works better without West and the conspiracy complications. However, they don’t make a huge difference, and it seems likely that we’re stuck with them; obviously director Nicholas Meyer prefers the film with those moments included. Star Trek VI: The Undiscovered Country appears in an aspect ratio of approximately 2.0:1 on this single-sided, double-layered DVD; the widescreen image has not been enhanced for 16X9 televisions. Note that the disc presents an aspect ratio different than that of the flick’s theatrical exhibition. Country ran on the big screen at 2.35:1, but it has always been opened up moderately for home video. Others will argue whether or not this is a good or a bad thing, but at this point, it seems moot. Clearly director Nicholas Meyer prefers the less wide ratio, and it appears extremely unlikely that we’ll ever find a release of Country with different dimensions. Sharpness mostly looked positive. At times, wider shots came across as a little iffy and ill defined, but those instances didn’t cause significant concerns. Some looseness also occurred due to the lessened resolution that accompanies a non-anamorphic transfer; occasionally the image was a bit soft. Still, most of it seemed fairly accurate. Only minor issues with jagged edges or shimmering occurred, and I noticed just a little light edge enhancement. Though not major, source concerns created most of the transfer’s distractions. I noticed occasional examples of specks plus a small hair or two. Country displayed surprisingly high levels of grain, but those likely emanated from the original photography. Super 35 flicks often suffer from excessive grain, so it didn’t seem like a surprise that this occurred here. Nonetheless, the graininess of the image made it look murkier than I’d like. On the other hand, colors seemed strong. The film presented a nice array of hues and made them look bright and vibrant. From the deep reds of the uniforms to the purple Klingon blood to the green lighting of the Klingon bridge, all the tones were detailed and concise. Blacks also seemed dense and tight, while low-light shots appeared detailed and well depicted. Though not a great transfer, Country merited a “B-“. Back in 1991, Star Trek VI: The Undiscovered Country was the first film to run theatrically with Dolby Digital 5.1 encoding. It did so unofficially as a test; Batman Returns enjoyed the first formal release as a Dolby Digital title. Though not a spectacular track, the mix continued to work well after more than 12 years. The soundfield presented a nicely smooth and seamless affair. The score offered nice stereo delineation, while effects appeared logically placed and they meshed together accurately. Throughout the different settings, the elements popped up in natural locations and created a great sense of atmosphere. 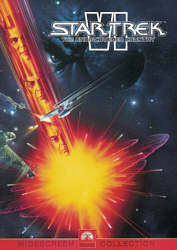 From more subtle moments like the Klingon trial to louder ones such as the explosion at the flick’s start, the track provided an active and involving feeling. The surrounds only sporadically gave us stereo imaging, but they seemed like a reasonably active affair. The back speakers offered a lot of reinforcement of the front and kicked in nicely during the action scenes. They added a solid sense of involvement to the piece. Audio quality also was excellent. Speech consistently came across as distinctive and natural, and I noticed no signs of edginess or concerns connected to intelligibility. Music was dynamic and bright, with a good sense of range. Effects really excelled throughout the flick. They always were crisp and clear, and I thought they represented the material well. Bass response seemed particularly terrific. Low-end was always deep and impressive, and those elements lacked distortion or boominess. Ultimately, the audio of Country provided a fine piece of work. Unfortunately, the DVD skimped on extras. It included only two trailers. We get both the teaser and theatrical ads. Arguably the best Star Trek flick, Star Trek VI: The Undiscovered Country has lost a little luster over the last 12 or so years. Nonetheless, most of it works nicely, and it remains probably the most exciting and fun of the series’ movies. This DVD presents decent picture, solid sound, and almost no extras. In early 2004, Paramount finally revisited Country with a new Special Collector’s Edition. This presents a new, slightly-improved anamorphic transfer of the film with the same 5.1 audio and a much expanded roster of extras. Since the SCE retails for five dollars less than this bare-bones version, it obviously is the one to get. Skip the old disc and pick up the more elaborate one.